The Baby Boomers keep booming — even as they age, they affect the communities in which they live simply due to sheer numbers. As this population grows older, the number of senior residential facilities grows as well. The need for independent living, assisted living, and memory care services will continue to expand nationwide in the near future. According to data provided by the US Census Bureau, more than 20 percent of the total population of McLean County is age 55 or older. Another 13 percent of the population is aged 45 to 50, so within a few short years, this group will also qualify, at least by age, to live in a retirement facility. Thus, the need for more beds for assisted living and memory care is clear. Case in point: The Villas of Holly Brook facility at 2016 Fox Creek Road in Bloomington boasted an occupancy rate of more than 56 percent after being open less than six months. Jen Stanberry, the Executive Director at The Villas of Holly Brook has a background in long-term care. 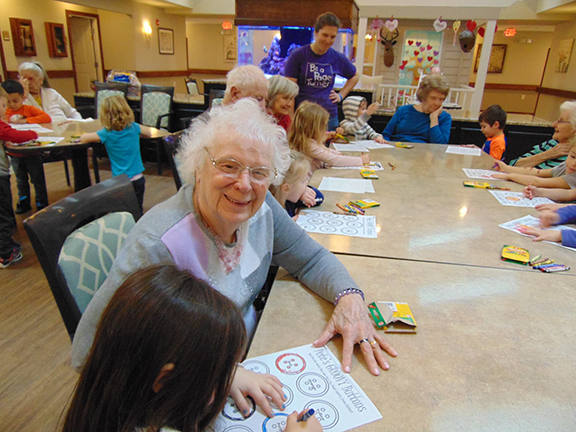 She started with The Villas of Holly Brook Senior Living as an organization in August 2016 and opened the Pekin community just a few months later in October. 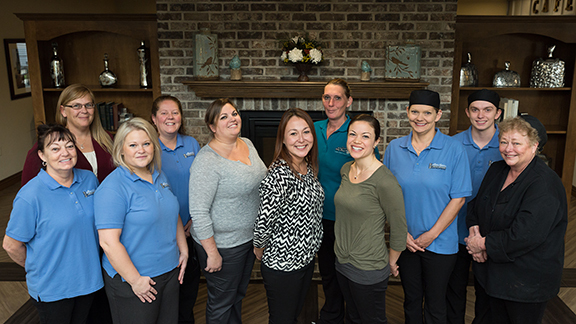 Her role has been the same in Bloomington: to hire an outstanding team of professionals and support staff who will care for the residents and make people happy. The Fox Creek Road community opened in October 2017, and the second Bloomington location on Towanda-Barnes Road, just opened in March 2018. 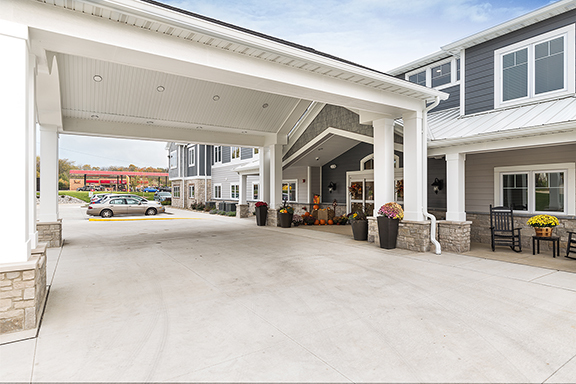 The Villas of Holly Brook is one of the recent assisted living companies to provide homes for independent seniors, those who need assistance, and those who need memory care in Bloomington-Normal and the surrounding communities. The Villas of Holly Brook and Reflections Memory Care communities represent the dedication to excellence, strong values, and deep faith of entrepreneur Reggie Phillips and his family. Based in Charleston, Illinois, Phillips became a custom home builder after graduating from Eastern Illinois University. His company, Unique Homes, enjoyed much success and he later diversified into commercial properties, including hospitality and student apartment facilities. Phillips saw a need in the community for quality assisted living services, so he designed and built the first Villas of Holly Brook based on the amenities, needs, and values he felt residents would want. His vision was to build a place that he’d want to go when he retires. Building on that success, each successive community features improvements in design, services, and amenities so that each resident receives the best value possible. Instead of focusing on the decreased abilities of senior adults to do some things for themselves, the staff at Villas of Holly Brook focus on the residents’ desire to still live a full and engaging lifestyle. Therefore, if a resident needs some assistance in remembering to take their medication, or some help getting dressed, or simply want to be around more people their own age with similar interests, the Villas of Holly Brook strives to be the place they can receive the help they need and can truly feel at home. The Villas of Holly Brook and Reflections Memory Care communities present the latest trends and technology in the assisted living business. 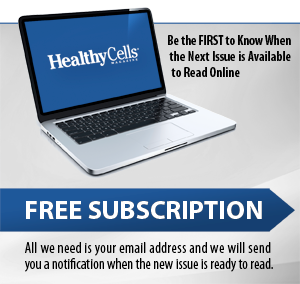 All medical information is stored and updated electronically. 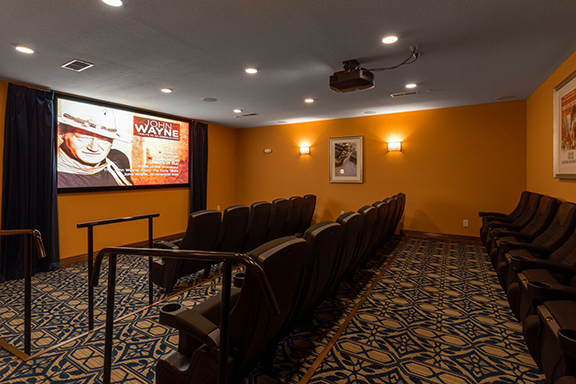 Each location has amenities such as a gym with circuit training equipment that residents can use on their own or as part of physical therapy services; a small theater with blu-ray DVD players, Netflix, theater seating, and a popcorn machine; a library and computer lab with free wifi; a wellness room for group exercises, such as low impact aerobics, chair exercises, yoga, or other exercise classes led by staff; and a variety of other special features. In addition, planned activities take place regularly, including outings to special events, dinners, shopping, or other happenings. Transportation to and from these planned events is available. Additionally, if a resident wants or needs to go to an appointment or any other activity and is in need of a ride, transportation can be provided as long as it’s not already scheduled for another purpose. All these services are provided to help residents feel not only part of a community, but also independent enough to make their own decisions. 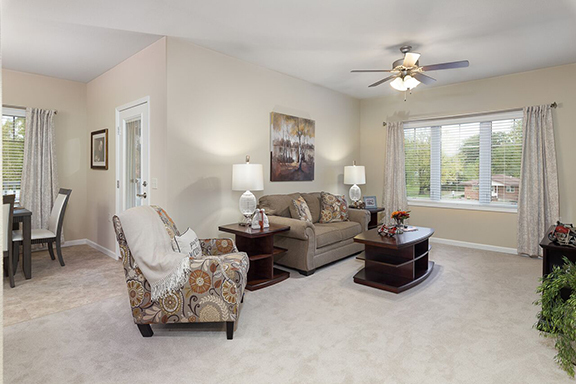 As one of the newest communities in an ever-growing organization, the Villas of Holly Brook on Fox Creek Road in Bloomington offers residents three different options for their living space. 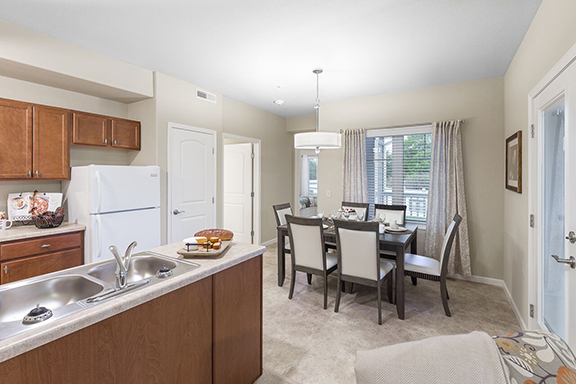 The one-bedroom, two-bedroom, or two-bedroom deluxe apartments provide as much or as little room as they want, and to make it feel like it’s truly their own space, the residents furnish their own apartment. Each apartment includes a full-size refrigerator and a microwave, and the two-bedroom deluxe units have a full kitchen. Three meals a day are provided and residents can eat anytime during the open dining hours. There’s no assigned seating, no permanent “reserved” time that they must adhere to on a daily basis. Meals are prepared on-site by a certified chef and are served buffet style. In the event that the munchies hit outside of mealtimes, the snack options include a popcorn machine, an ice cream machine, hot dogs, cookies, and other snacks to tide a person over until the next meal. Other amenities that enable residents to feel as if they are truly “at home” include apartments that are available to rent for visitors to stay overnight. The common areas can be reserved, free of charge, for private family events such a birthday party, family dinner, or reunion. “Most of the things people could do in their own home are available to do here,” Stanberry explains. Respite care services make it easy for caregivers to take a break: their loved one can stay as long as necessary in a furnished assisted living apartment at the Villas or private suite in the Reflections Memory Care. 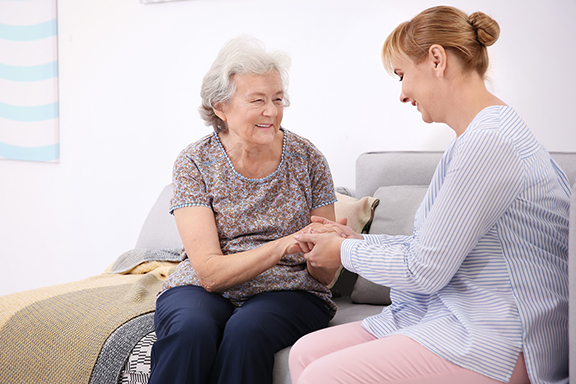 An onsite nurse provides care as needed to the residents, and Certified Nursing Assistants are available all day, every day to help residents with whatever needs they may have. 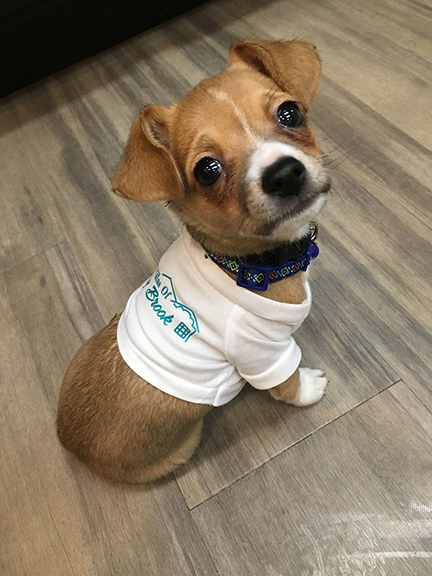 The Fox Creek community goes even one better: they have a resident puppy named Harley who charms everyone with his sweet nature and uninhibited affection. Harley goes home every night with Stanberry, but he’s ready to go to “work” every morning. The Villas of Holly Brook on Fox Creek Road and Towanda-Barnes Road offer seniors the type of lifestyle options they want — and may eventually need — to enjoy their retirement years. It’s not so much a matter of aging gracefully; more exactly, it’s the ability to live full and engaged lives, taking health and wellness needs into account often before they become the driving force for finding specialized care. For more information about The Villas at Holly Brook, visit villasofhollybrook.com or call 309-808-4069.